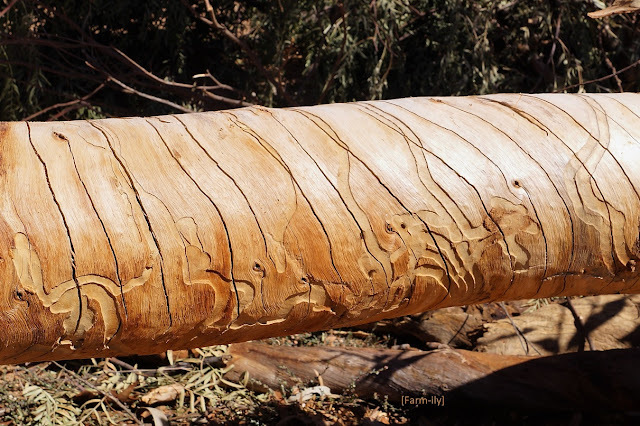 Is it insects that make these patterns in timber and bark? Yes, Eucalyptus Longhorned Borers I think. This branch came down during the windstorm 2 weeks ago. The borers attack freshly cut timber, dying limbs or drought stressed trees. I'm guessing that the fracture lines happened when the timber fell, but the borer markings where there before it fell. She is an incredible artist - with THE best galleries. This is really really beautiful. I love discovering nature's art. Wow that is really cool looking. Great find.